Even though it was already mentioned in previous news post, Stream still gets its own as well. Quoting! "it’s about time for our monthly work stream to show you guys some stuff in motion. This time, we’re scheduling it for Friday, March 24. Same time (3PM PT), same channel (twitch.tv/manesix). If you’ve got any questions, comments, doubts or whatnot [re: Game delay], you can come in to the stream and have a talk with us. We’ll be going through a general overview of the game progress and showing what’s been new since last stream, as well as talking a bit about what’s still needing to be finished and what the extra time will allow us to do." I have no idea what's Fred is doing to Oleander horn. 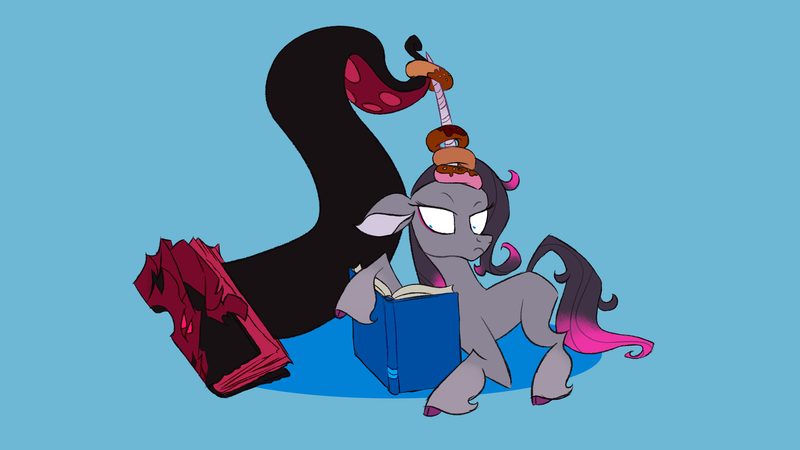 Putting/Removing donuts from her horn. Judging by Oli's expression, it could be any. I forgot I had this saved on my phone from last stream. Hopefully someone was kind enough to return the sails in time for the upcoming stream. Will Cristina be around for any of the upcoming streams? Fred is being passive aggressive about his not liking that Oleander is reading other books. Nah, he's just making use of a unicorn's built in doughnut holder. Also would Sonicfox be able to make an appearance? I wanna see him vs Oreo. We'll be releasing a beta, not a demo. A demo is a purposefuly cut slice of a game containing finished, polished material which showcases fully functional game systems, released shortly before or at the release of a game, meant for press and sometimes for potential customers to sample the game before trying the entire thing. A beta is an incomplete, work-in-progress version of a game, meant for testing of systems and/or balance, released to a specific subset of people (closed beta) or available to everyone interested (open beta), for a limited period of time before launching a game (or new game content). The game will not be fully stable or complete during beta, given we're going to be tweaking the fluff-lovin' shiznit out of it until we're satisfied with product for a 1.0 release. Is there a 1920x1080p version of that header image? Pretty please with sprinkles on top? Went ahead and colored it for you guys too, enjoy! New desktop background incoming!!! Thank you! Fred looks at Oleander horn with [TFH Limited Edition Panic] donuts on it like her idle animation "it's just a placeholder for the moment or is it?". I guess there will be some food and other items appearing on some of the other characters ears, horns, hoofs, paws [including G.O.A.T, predators and scouts] and antlers in the visual lobby. I think it's the longest stream yet. Was it really? Felt shorter. I got to ask a lot of questions that I recorded on ShadowPlay! I think the stream lasted a loooooooong time, and it was pretty fun!